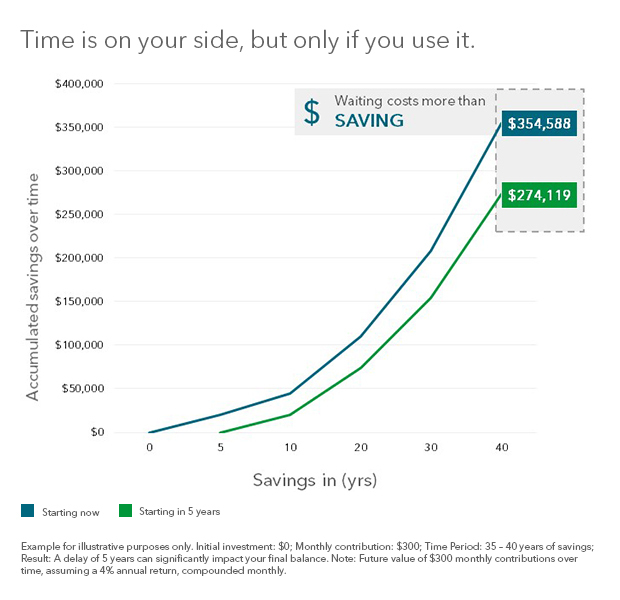 For most people, retirement saving is something that you “learn on the job”—often without a lot of guidance or help. Whether you are someone who seeks professional advice or likes to research and make decisions on your own—below are a few common retirement saving misconceptions that I wish someone had told me about when I started investing. I get it—if you’re starting out, you make less money and probably are more focused on immediate stuff like repaying your student loans and credit card debt. But you are likely better off in the long run if you start investing as soon as you begin working. For one, you may be eligible for “free money” in the form of an employer match. And most importantly, the sooner you invest, the more time your money has to grow. Many employers set what’s called a default savings rate—that’s the percentage of your salary you save toward retirement, typically between 3 and 6%. You should think of this as a starting point rather than a guideline. Generally speaking, your default savings rate will have no relationship to the amount you should be saving in order to meet your financial goals. Instead, take a few minutes to use a retirement savings calculator (your plan’s website likely has one) or sit down with a financial planner to develop a personalized savings plan. It’s human nature to react to financial losses more strongly than we do to slow, steady gains—which unfortunately leads some people to “buy high and sell low” rather than the other way around. The problem with trying to time the market is that you have to correctly time it twice—first, when you sell (to avoid the loss) and second, when you buy back in (to benefit from the gains). It’s extremely difficult to predict these movements in the market, and missing just a few of the top-performing days can really hurt your long-term savings goals. Even during periods of volatility, most of us are better off staying the course. While it’s true that your retirement plan may offer several distinct investment choices, you won’t likely achieve the right level of risk and diversification by simply dividing your money across all of them. Instead, see whether your plan offers a professionally managed solution, like a target date fund. A well-managed target date fund can offer two benefits—one, they are automatically diversified across several asset classes, and two, you can invest in one that correlates to your planned retirement date—so it automatically becomes more conservative the closer you get to retirement. It’s difficult to ignore past performance when you’re evaluating where to invest next. Yet there’s a reason why most fund advertisements include the language, “Past performance is no guarantee of future results.” In fact, past performance is frequently unrelated to future results, which is why most financial professionals recommend diversified portfolios over chasing yesterday’s returns. Learning how to save was a matter of trial and error—my errors and those of my friends and co-workers. I learned from my experiences around saving, investing and retirement planning and hope to save you from making some of these mistakes. For more information on how to handle your 401(k), please visit our retirement center.